Indonesia, the world's fourth most populous country, has a diverse ethnic group, including Chinese descendants that have lived here for generations. The Chinese New Year, familiarly known as Imlek, is celebrated across the archipelago. This year, Imlek will fall on February, 16 followed by Cap Go Meh celebration 15 days later. 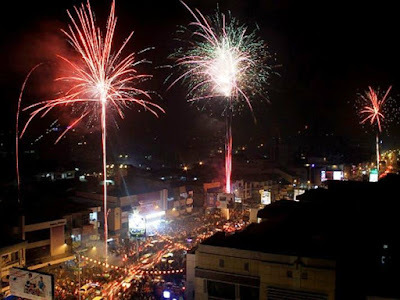 While most of major cities will have their own festivals and celebrations, Pontianak and its neighboring city of Singkawang in West Kalimantan offers you the experience you won't found elsewhere. According to history, in the 18th century, a gold rush attracted miners from China to West Borneo (West Kalimantan). Thousands of Chinese immigrants eventually settled in and intermarried with Kalimantan people, thus, Chinese culture was rooted deeply and fused with the local traditions. Pontianak, as the capital of the province, is populated by various race and ethnic groups, including Chinese descendants who still preserve their way of living and traditions in this equatorial city. Meanwhile, 145 Km north of Pontianak, Singkawang has a very strong oriental atmosphere with hundreds of Chinese Temples decorating almost every part of the city. Chinese Indonesians make up 70% of the population of the city. The normally quiet city comes alive with all sort of festivities during the Chinese New Year. Chinese descendants from other regions including Java, Sumatra, and even from abroad such as Malaysia and Singapore always flock to the city to celebrate the special occasion. Imlek is always celebrated in a grand scale with entertaining performances and a vibrant atmosphere. Every year during the Chinese New Year celebration, houses, shopping malls, Chinese temples, offices, and other buildings will be covered with all sorts of red and gold ornaments and decorations. The hype will come to its pinnacle on the eve of the New Year when revelers celebrate the year of the dog with epic firework fiesta and endless sound of firecrackers. 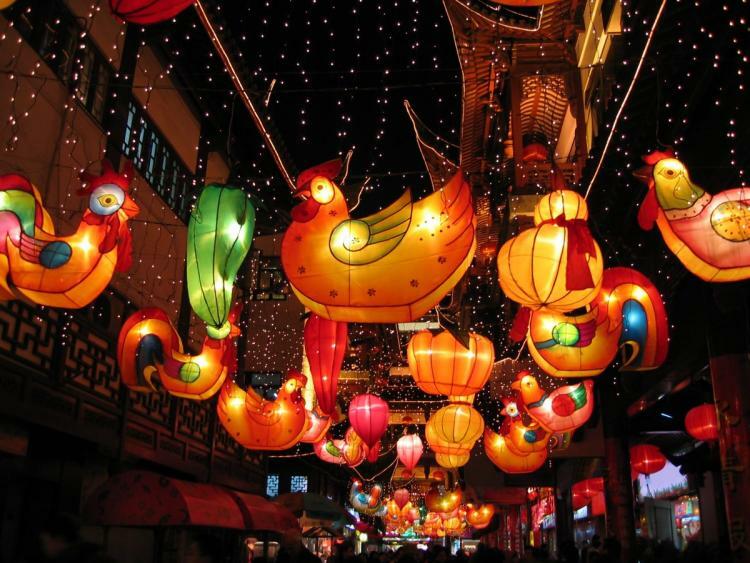 Chinese music, lantern parade, as well as acrobatic dragon and lion dance will also take to the streets. Aside from grand celebration, one thing that have always been a part of the Chinese New Year tradition is eating sweet snacks. 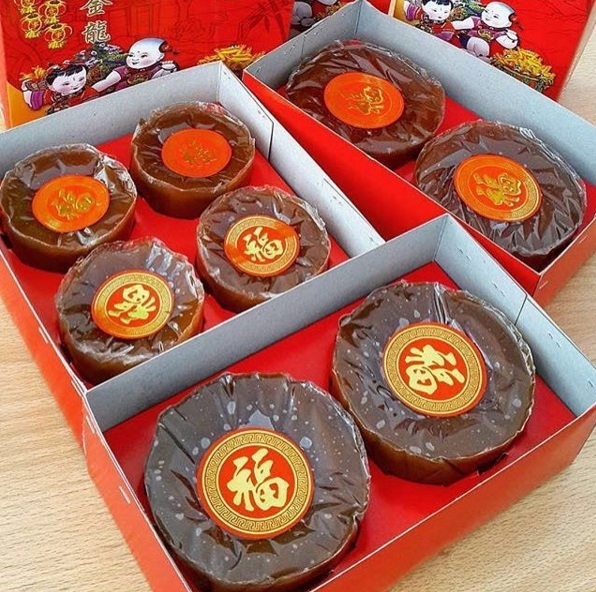 The most familiar one is Kue Keranjang, also known as Nian Gao or "the Chinese New Year cake" because it is made only during Imlek celebration. Another popular sweet treat of Pontianak that also highlights the celebration is Dodol. 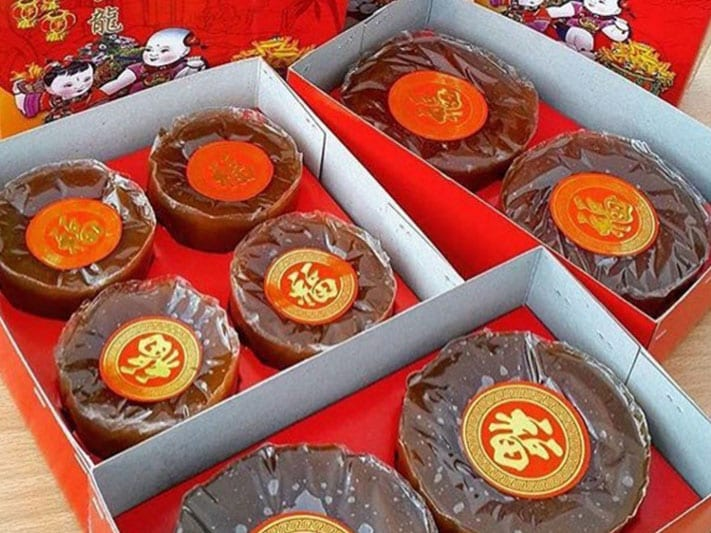 This sweet and chewy delicacy comes in various taste such as sticky rice, pineapple, pumpkin, green bean, and more. For a truly authentic taste of Pontianak, you should try Lempok Durian, a special type of Dodol made from Durian fruit. When in Singkawang be sure to drop by some of the city's most beautiful temples. After marveling at the temples enchanting architectures and decoration, why don't you complete your experience by having your fortune read using the ancient method of Ciamsi. 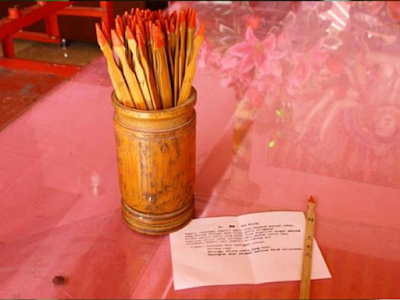 Fortune telling can help you prepare for the coming year. Ciamsi uses a number of small bamboo sticks (usually around 60 – 100). 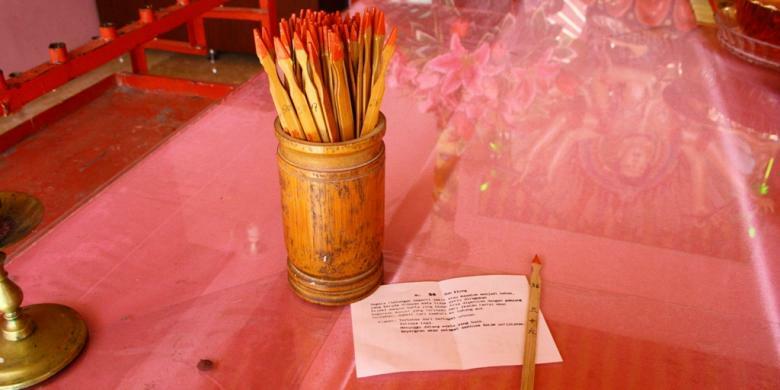 A stick will fall as you shake the container and the number on the stick will tell you your fortune. Good luck! Just like Pontianak, as well as most major cities across the archipelago, Singkawang also dresses up for the coming Chinese New Year Celebration. In Singkawang, you will be presented with a unique representation of the 12 Shios or Chinese Zodiacs in the form of giant lanterns. The animals such as chicken, rooster, and dragon represent certain characteristics and philosophies in Chinese culture. The lanterns are placed at several points throughout the city. In addition, a couple of 3 meter long lanterns will be installed at the city's main roundabout to greet visitors to the wonders of Singkawang. The Chinese New Year Celebration will come to its pinnacle on the 15th day with the Cap Go Meh celebration. 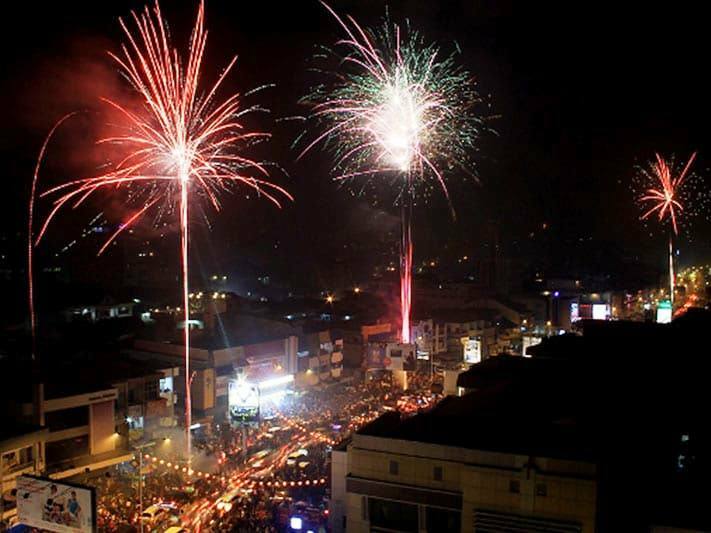 This is when Singkawang stages a citywide fiesta of the year. 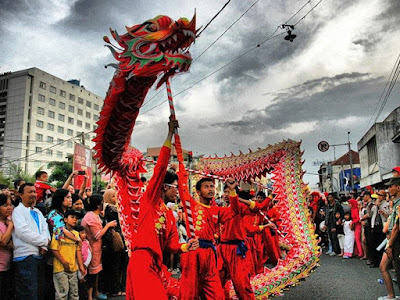 Singkawang during Cap Go Meh celebrations is jam-packed with people, and the city reverberates with the drum beats and cymbals of lion dance, dragon dance, and choi lam shin, as everyone awaits its highlight: the parade of Tatung spiritual mediums. This ritual is not suited for the squeamish and for kids to watch due to its stunts. Tatungs are people acting as a medium for the Cap Go Meh ritual. The ritual is meant to ward off evil spirits, and cleanse the town and temples from evil and misfortunes. During the Tatung rituals, participants enter a trance state and perform various spine-chilling stunts, such as stepping on a sword, or piercing steel wires or nails into their cheeks or through their tongues. Despite such physical tortures, the Tatungs remain completely unscathed, which is simply unbelievable.